A Windhorse Update about 2011! Greetings! 2011 has been a very successful year for the Windhorse Foundation. Thanks to the caring and generosity of Windhorse supportors, we began the year with multiple hosted fundraising events. As a result, we were able to fund our projects and make positive changes in the lives of desperately poor people in Laos. Because of your generous donations, we provided much needed support for all our projects during our summer trip to Laos – Hmong Village, Deak Kum Pa Orphanage, and Lao American College. Thank you!!! 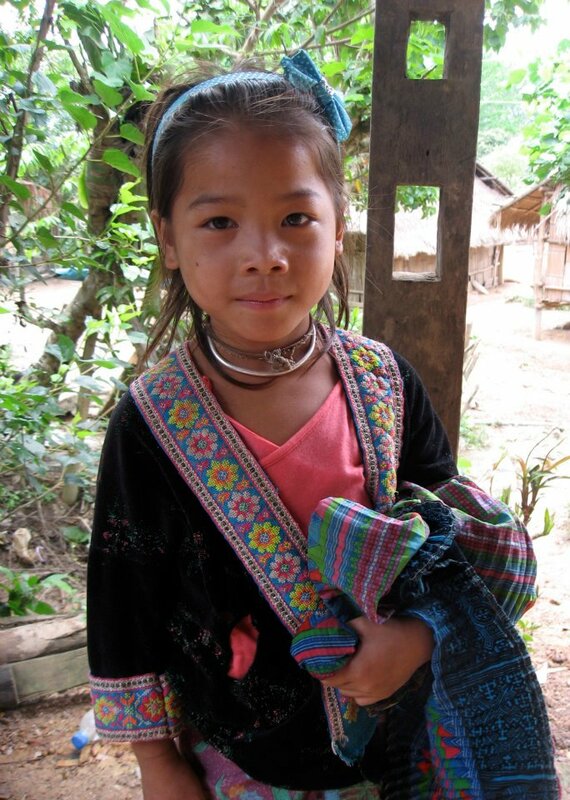 While in Laos this past June, we took another peaceful 2-day trip down the Mekong River from Huay Xai to Luang Prabang, stopping along the way at the Hmong village we have been helping since 2009. During the visit we provided the village a custom-built metal long boat which will be a tremendous help to the village, enabling them to sell their rice harvest, transport people to get medical care, send children to secondary school, and much more. Since there are no roads to the village, having a boat ends their isolation. Your funds also enabled us to provide badly needed medical supplies such as first aid ointment, diarrhea and fever remedies, vitamins, aspirin, and other medicines. We also bought 2 cows and a calf for the village, as well as school supplies, a blanket for each of the 57 families, clothing, sandals, and tuition for the chief’s daughter to complete her 11th level schooling. The village still needs educational support, food, and livestock so there is much more to do in order for it to reach self-sustainability. Our stay in historic Luang Prabang included a visit to the Deak Kum Pa Orphanage, which we have been helping since 2010. During the visit we provided funds for food, health related assistance, school supplies, and other general maintenance for the orphanage of 550 children from poor local Hmong, Khmu, and Lao villages. While at the orphanage we downloaded about 30 online learning modules on computers at the computer lab that will help the children learn English, Science, Math and other subjects. Thanks to the eLearning for Kids non-profit organization for donating the learning modules. We are also now sponsoring 10 recent high school graduates who are currently attending their first year of college. A college education makes a huge difference in the lives of these children!! These past months have also included fund-raising efforts in Woodstock, New York through a project called “One Voice for Laos." Our friends in New York have led multiple fundraising activities to help support the orphanage and are planning an end-of-year event to raise more money. In 2012 they will lead a group of high school students on a Laos trip to help with construction projects at the orphanage and to teach English. For 2012 we are planning a fundraising concert with theYouth Rock the Rebuild organization in Mill Valley, California along with other community related fundraising activities to help the children. At Lao American College in Vientiane, “education is the key to a greater future.” This is done through two undergraduate degree programs – English and Business Administration – aimed at enabling students to build a better future for Laos. Windhorse has provided funding to buy desperately needed computers and peripheral hardware. We will also be supporting efforts to add a third degree and certificate program for Hospitality Management, which will help students gain employment with the increased tourism industry in Laos. Another exciting project entails sending over a large shipment of textbooks. In partnership with Pearson Publishing, we will be sending approximately 10,000 donated textbooks by 20-foot sea container to Lao American College for distribution at the college and American High School as well as other schools in the Provinces of Laos. These textbooks are valued over $400,000…a big contribution for a country where books are in sparse supply. We need funding for logistical costs incurred in shipping the books so if you would like to help, please donate. we met our goals to raise funds, support our projects, and partner with individuals globally as well as locally to help with our projects. Thanks to your donations and support this has all been possible! Your continued support is well appreciated.